Violence against women and girls is often perpetuated by practices defended by some community members on the basis of tradition, culture, religion or superstition. These include female genital mutilation/cutting (FGM/C) and early marriage. Such harmful traditional practices are underpinned by social norms, the rules of behaviour that people in a group adhere to because they believe that they are expected to do so and that others do so. In Nigeria, one in four women aged 15-49 has undergone FGM/C, and 48 percent of women aged 20-49 were married before the age of 18. Enough, a worldwide Oxfam campaign, aims to replace harmful social norms with positive ones that promote gender equality and non-violence. 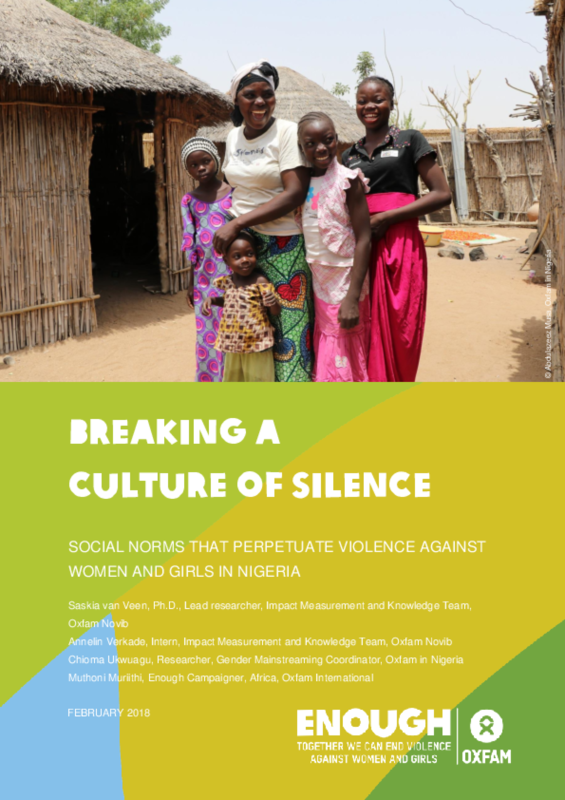 To better understand which social norms perpetuate traditional practices in Nigeria and how they influence behaviour, Oxfam in Nigeria conducted formative research by interviewing 20 men and 20 women and analysing the results in a campaign design workshop with partner organizations and experts working on violence against women and girls. The findings will inform the development of the Enough campaign in Nigeria. From the research and subsequent analysis in the workshop, four social norms were identified as drivers of the harmful traditional practices FGM/C and early marriage: A respectable woman marries early; A respectable woman is submissive to male authority; A suitable woman is not promiscuous; A woman is worth more as a wife than as a daughter. Women and girls who transgress these norms face four main kinds of sanction: peer pressure, condemnation, exclusion and force. Encouragingly, although the research found that respondents believe others still think it is appropriate to follow traditional practices, many of the respondents' own individual attitudes have already shifted - a first signifier of social norms change.